I fell in love with motorsports after I got married. I used to follow my husband to the tracks as many of his friends are involved in this sport. We used to go for go - cart a the Sunway Extreme Park and sometimes at the Shah Alam Stadium. In fact, before the Shah Alam Circuit was closed, we used to go there too to watch the race at the same time supporting our friends who took part in the race . The interest in motorsports continues as my three kids love it too. It has now become the family's interest and activity. Whenever we are free, we will for g0 - chart together or to the Sepang International Circuit for GT Japan, F1 and MME. 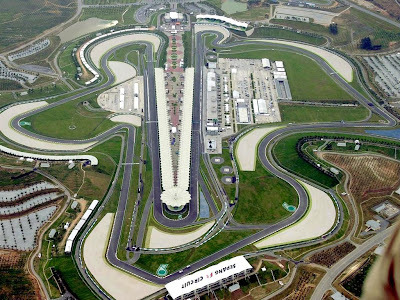 Most probably we will be in Sepang too for the Motor GP. What is Merdeka Millenium Endurance or MME? . It's a race that involves all kinds of cars and in different category. You can find Porsche, Lotus, Honda Type R, Toyota Celica , Honda Civic Coupe, Subaru Imprenza, just to mention a few. This race is a non - stop car racing, for 12 hours. It started at 12 noon on 30th August and finished at 12 midnight. Each team consists of 4 to 5 drivers who will take turns in driving the car throughout the 12 hours. The admission is free. There were many visitors from SM Teknik Batu Pahat, SM Teknik Pasir Mas, Kelantan and Kolej Komuniti Hulu Langat from the T- shirt they were wearing. Anyway, we did not wait until the end of the race. But watching it in front of my TV set. We met Mr Karamjit Singh, Malaysia's famous rally driver. He was very friendly to everybody. Many of the visitors grabbed the opportunity to take pictures with him. Besides the race, there were also colouring competition and traditional dance competition for children, booth selling car accessories, souvenir of the MME, car exhibitions where cars which have been modified or gone through a make- over took part in the exhibitions. Before we left, we dropped by at the Automonbile Museum. It's great to be watching the fast cars with sound of the engine roaring like a thunder ! !